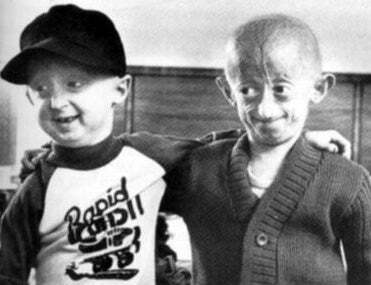 One in every 4 million children suffers from a genetic disorder called progeria that causes them to age prematurely — developing wrinkled skin and baldness before the age of 10, and usually dying of heart disease or stroke by puberty. The disease has always intrigued researchers interested in unlocking the genetic key to aging. Now it looks like a group of geneticists at the National Human Genome Research Institute in Maryland may have found a drug that can reverse the effects of heart disease caused by premature aging. In an article published today, the team also suggests that this could have ramifications for adults with heart disease too. The group, led by geneticist Francis Collins, used transgenic mice designed to develop symptoms of heart disease like human children with progeria do. They treated the mice with a cancer drug called tipifarnib, part of the FTI family of drugs which are being used experimentally to treat several forms of cancer. It worked incredibly well. Below, you can see a diseased blood vessel at left, and on the right a healthy one treated by the drug. This approach worked much better than we thought it would. Not only did this drug prevent these mice from developing cardiovascular disease, it reversed the damage in mice that already had disease. If these drugs are found to have similar effects in children, this could mark a major breakthrough for treating this devastating disease. In addition, these findings shed light on the potential role of FTI drugs to treat other forms of coronary artery disease.